Michael Krumm and Lucas Luhr in the JRM Nissan GT-R No.23 wrapped up the 2011 drivers' title with second place in the Qualifying Race at San Luis. The race was won by the No.11 Exim Bank Team China Corvette of Yelmer Buurman and Francesco Pastorelli - Corvette's first win of the season - on their maiden GT1 outing. In a typically frantic start, Buurman got the jump on Krumm and had opened up a gap of over five seconds by the time the pit window opened. Luhr had managed to reduce the defecit to just a car length in the closing laps but Pastorelli held his nerve to secure victory. Third was the All-Inkl.com Munnich Motorsport No.37 Lamborghini of Franceso's elder brother Nicky and Dominik Schwager. The No.38 Lamborghini of Marc Basseng and Markus Winkelhock was sixth to add to the German squad's claims on the teams' championship. Fourth place went to the Sumo Power GT No.20 Nissan GT-R of Nicky Catsburg and Enrique Bernoldi with Tomas Enge and Alex Muller in the No.7 Aston Martin fifth to keep their teams' chances ticking over. A major problem with the right rear wheel nut on the Sumo Power GT No.21 cost them any chance of a podium place after a strong first stint by Jamie Campbell-Walter. When the wheel was eventually secured, David Brabham rejoined and fought back to finish seventh. 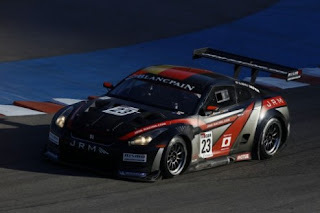 An early clash between Peter Dumbreck in the JRM Nissan GT-R No.22 and Ricardo Rissatti in the Marc VDS Ford GT No.40 resulted in both cars limping into the pits. The Nissan rejoined 17 laps adrift after a lengthy repair to the right rear suspension, while the Ford remained in the garage with front structural damage. The sister Ford of Maxime Martine came to a halt with 8 minutes remaining to complete a disappointing race for the Marc VDS team. The best of the Fords was the No.10 Belgian Racing entry of Markus Palttala and Antoine Leclerc in 10th. The other Belgian car was 12th. The are still several permutations for second and third in the drivers' title while the battle for the teams' championship will be decided tomorrow. As it stands, Young Driver lead the chase on 227 points from JRM (224), Hexis (195) and All-Inkl.com Munnich Motorsport (190).